So, you've heard about these new agile management techniques. You may even have attended a conference session or have read a book on it. It all sounds so simple... in theory. But how do you get started? The #1 topic people ask about when learning agile is how to estimate and build schedules using these methods. Our project sponsors need to know how much a project will cost and how long it will take before they can authorize us to begin. How do we prepare reasonable estimates and a schedule when we haven't done our detailed requirements analysis? 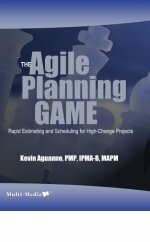 While there are several solutions to this problem, the most popular is called The Agile Planning Game. This technique brings together a whole multi-disciplinary team and builds a consensus on a set of estimates. The Agile Planning Game is specifically designed to avoid the problem of "group think" -- where minority opinions are withheld to avoid criticism or due to a lack of self-confidence. With input from all affected disciplines, the result is a set of estimates that are less likely to miss an important aspect of the work, have full team buy-in, and are more likely to match the actual work effort required. This 90-minute video will show you the technique that has taken the agile world by storm: The Agile Planning Game. Learn how to use this technique to prepare estimates and schedules for your agile projects, and improve your chances of project success.